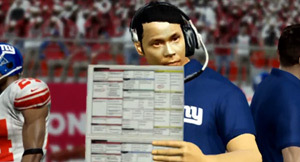 Coach Jarin will try to get his first win vs the Redskins this week. Last season coach Jarin lost twice to the Redskins, his last loss came in week 13’s Game Of The Week. “It was a tough one to take, we felt we had a chance but our execution was just lacking.” said coach Jarin in today’s press conference. With a win the Giants can move into a tie for first place in the NFC east, the Giants have are 3-2 this season, while the Redskins are 3-1.